Susan Toy has been a bookseller, an award-winning publishing sales representative, a literacy teacher, and is now a published author, publisher, and promoter of fellow authors and their books. Born and raised in Toronto, after completing a degree in English Literature at Queen’s University in Kingston, she moved to Calgary in the late 70s and immediately found a job in a bookstore, beginning what has become a life’s career working with books and their authors. She’s the author of Island in the Clouds, a Baquia Perspectives mystery novel. Susan , thank you so much for being here. Before we talk about your WIP, what else can we know about you? I’m retired from paid work and now move back-and-forth between Canada and the Caribbean. I have always read voraciously and was fortunate to have enjoyed a career working with others who also love books and writing. I met so, so many great authors along the way – too many to count – and have become friends with most of them. I have always been their champion or cheerleader, in a sense, so carrying on with author promotions on my blog, Reading Recommendations, is a way of staying connected and paying them back, in a sense, for writing so well. Aside from reading, I love to cook and am constantly experimenting with food and recipes. I share a house in the Caribbean with four cats and one partner/property manager who has never found a dead body floating in a pool. That’s good to know! What are you working on right now? 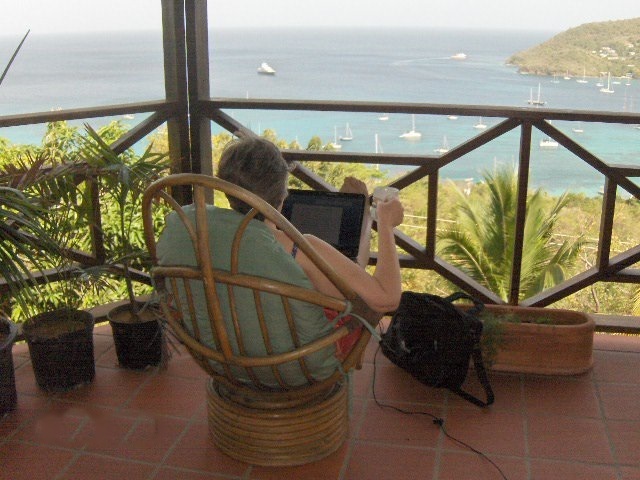 I’m rewriting and editing a second novel in the Bequia Perspectives series. This, and the next two, were written about a decade ago, before I knew what I was doing. Since publishing Island in the Clouds, I now have a better idea of the direction I’m moving in with these books. Are you happy with the pace of your work? Do you aim at a specific word count each day? Are we ever happy with the pace of our work? I tend to be the Queen of the Procrastinators so am easily distracted from what I should be doing, and … Oh, look! Another author to promote or a blog post idea to write up! If you’re the Queen, then I’m definitely applying for a position as the lady-in-waiting. I do belong in the procrastinators’ court! Plotter, pantser or both? Definitely a plotter. I know exactly what’s going to happen, who does what to whom, and the timeline the story covers before I begin writing. I don’t write any of that down. It’s all in my head, but it’s definitely plotted before I begin writing. That’s not to say I don’t make changes after the fact. For instance, this new novel was written more than ten years ago directly after Island in the Clouds, including following the time in which it’s set, a few months after Island ends. Some of the same secondary characters recur in the second novel, but I recently decided to make a number of drastic changes to those characters and am introducing new ones into this next story. I’m essentially keeping the original scenes and action I’d already written, but new characters will be involved and I’ve added another plot thread to what I already had written. What’s your worst enemy in getting that first draft finished? I totally empathize. Have you ever experienced lack of inspiration or drive to write? If so, how do you motivate yourself? Could we take a look at your workspace? Is there a particular place you find inspiring for writing? Always. All the time. I have never imposed a strict work schedule on myself, mainly because I know I’d never adhere to it. (See above.) I don’t even have a particular work place where I write. When I’m in Canada, I find I can work quite well in coffee shops or at the library. I’m also not on an agenda to write and publish X number of books in Y length of time. I think by doing that to themselves, many (not all, but many) authors run the risk of producing less-than-perfect work. I’ve assisted authors who were extremely agenda-driven and, rather than taking the time to really hone their craft and enjoy the process, creating something of which we could all be proud, they were self-centred, miserable, and blamed everyone else for their lack of progress and success by insisting on following this rigid agenda of theirs. Remember, haste makes waste! I would hate for a drive like that to ruin my own life, so I try not to worry about the whole “motivated to write” thing. I did, however, manage to write for the 3-Day Novel contest sitting in this chair while looking at this view. A slice of heaven! Apart from Word and Google, do you use any other writing or research tools and apps? I wrote the first drafts of three novels using yellow legal pads and a pen. I transcribed that into Word and have been editing using Word ever since. (I took a few editing courses and learned how to use that system.) Now I may make a few notes by writing them into a notebook with a pen, but I always begin any new manuscript on my computer, in Word. I actually didn’t know of any other tools or apps. How do you intend to celebrate writing “The End” on your draft? That’s never been a celebration for me, because I know the fun part is over and the really hard work has only just begun. Which book publishing processes are you going to outsource and which are you confident enough to undertake yourself? Even though I have a great deal of experience in publishing books and I have published the work of other authors, I always bring in the professionals, at every stage of the process (editing, cover design, formatting, ePublishing and print publishing). The more eyes there are on any manuscript production the better to uncover potential problems and create a perfect book. I work with a Canadian eBook formatter who not only produces the various eFiles I require, but also looks after listing with online sales sites, including Overdrive which sells to libraries, and collects revenue from them all for the authors she represents. Every month I receive an email funds transfer of royalty payments. No fuss, no muss. It doesn’t get any better than that. Do you have any marketing tips or favorite promotional sites you’d like to share? I am constantly posting marketing tips and ideas of my own, and reblogging those of others, to my blog. One thing I will say here though is that authors should know who it is they’re writing for, who their target market is, and really aim for that group specifically in whatever promotion they do. Build up a fan base from that target market and let those fans do the promotion to their friends for you. Is mystery the genre you will stick to or do you see yourself branching out in the future? I kind of fell into mystery with my first novel because, at the time, it was the best way I could imagine to tell the story of Bequia. I prefer reading literary fiction and that’s the genre I’ve written in for all my non-Bequia stories. The mystery part of these Bequia novels was kind of meant to be a hook to get readers interested in what I’m really writing about in this quartet, which is Bequia. I do believe though that the story we have to tell decides the type of genre in which it best needs to be told. I don’t ever want to be slotted as a writer of one particular genre. That’s so limiting – for me and for my readers. I hope readers enjoy my writing enough to want to read anything I publish, no matter what the genre, or even the form. Fun stuff now: Let’s do a rapid fire round. Flavored sorbet or chocolate ice cream? Chocolate. Always chocolate. Trek in the Andes or snorkeling in Tahiti? Sitting on the verandah of my house on Bequia. Ugg boots or red-soled designer stilettos? Neither again. Running shoes or barefoot. Finally, please share with us links where we can find you and your work. My main blog, Books: Publishing, Reading, Writing (https://islandeditions.wordpress.com/), includes links to my bio, published novel, Island in the Clouds, publishing imprint, IslandShorts (where I have published one novella, That Last Summer), and the author promotion blog, Reading Recommendations (http://readingrecommendations.wordpress.com/). Thank you, Susan, and best of luck with the sequel to Island in the Clouds! Previous New Year’s Teaser – Don’t Kiss, But Do Tell! I can personally attest to Susan’s generosity and support of authors! Thank you so much for helping me find out more about one of my favorite authors and bloggers. As for Baquia, it looks heavenly indeed! Thank you so much for all your support, Nicholas, and for introducing me to MM Jaye! Thank you, MM Jaye, for hosting me on your blog! 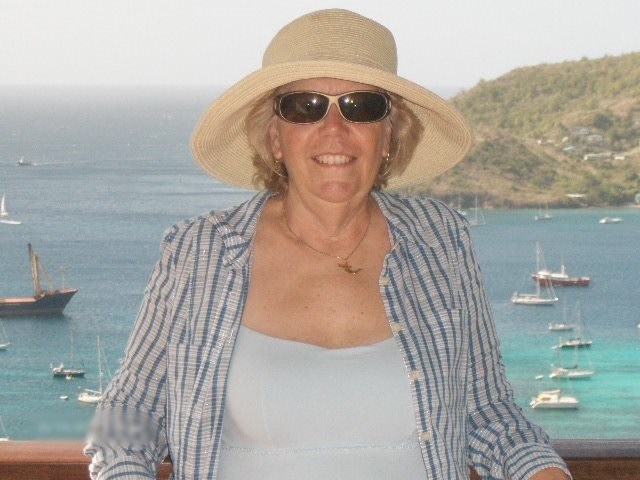 I enjoyed answering your questions and introducing your readers to Bequia! I’m featured in an interview on MM Jaye’s blog! Thank you, Maria! Wonderful interview, MM Jaye! It’s always good to learn new things and meet new people. And, Bequia has a spectacular view from her house. Indeed! Maybe that’s a good reason for Susan’s procrastination. How can a writer concentrate with so much to behold? I could picture myself sitting there with tropical breezes blowing across the veranda, a cool drink at hand and the laptop in front of me. What a view! What a way to write! Reblogged this on Dancing With The MS MonSter. Susan, you said you procrastinate, but are you mulling things over in your mind, plotting, creating character traits? If so that’s not procrastinating, that’s working. Unlike you, I could never get anything done on Baquia. I would not be able to pull myself away from all of that beauty. Hear, hear! Me neither 🙂 Thanks for the comment, Michelle! Brava, Susan! Boy, what I’d give to be able to write in that setting… Then again, that setting might just keep me from getting any writing done! Susan Toy is a talented author, a champion for indie writers everywhere, an informative blogger, and a wonderful friend. This interview on MM Jaye’s blog is a pleasure to read. Please stop by and read the whole post! Thanks for reblogging, Tricia, and for your very kind words!